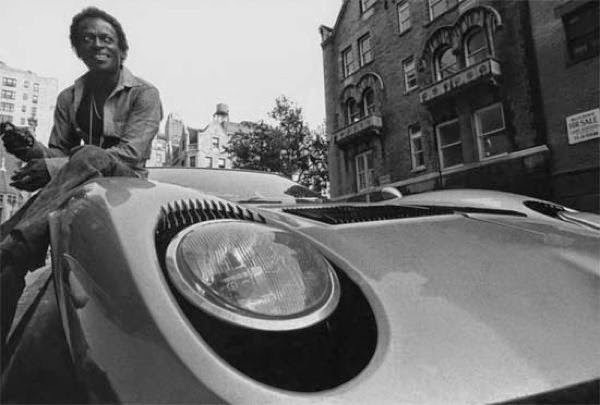 “Someone posted in Ferrari Chat that Miles Davis had fallen asleep at the wheel and stuffed his Lambo. I was there and responded. There was a bit more to it than that. He didn’t fall asleep at the wheel. He tried to make a right angle turn at 60 mph from the left lane of the West side Highway to the 125 ST exit across three lanes of traffic. He didn’t make it. He hit the WPA Stone exit ramp and the Lime Green Miura came apart like Brazilian plywood in the rain. I pulled over and ran back to his car. He was wearing leather pants and the bones of both of his legs were sticking through the pants. He was bleeding badly. He looked at me and said, ‘Is my car f#cked up?’ I told him the car was gone. He said, ‘I got to take a look.’ I told him both legs were broken and he wasn’t going anywhere. I ripped up a shirt I found on the floor and told him to hold the cloth over the bleeding with pressure as it was getting bad but not arterial. There were two large plastic bags filled with white powder on the floor and one had broken open. The interior was dusted. I grabbed the bags and ran to the sewer and chucked them. He screamed, ‘What The F#ck You Doing!!? ?’ I used rain water to wipe down the car as best as I could. The cops arrived. One of them asked me who I was. I told them just one of the guys he cut off. He looked at Miles and at me and told me to split.